Fast Company’s 100 Most Creative People in Business list includes a slideshow featuring its 10 most creative women in business. I love exploring mini-resumes of the successful (the rich, the best dressed). It’s even more fun for me if they’re anointed as “Most Creative,” especially if they’re marketers. Jessica Buttimer’s bio captured my attention, not only because of what she’s done, which was to bring green cleaners improbably to Clorox , but because of what she’s charged with doing now: keeping the so-ugly-it’s-cute shoe hot. Since introducing the first new brand for Clorox in 20 years with Green Works, Buttimer has launched into new territory: footwear. As the new vice president of marketing for Deckers Outdoor Corp, Buttimer will oversee branding initiatives for companies like Teva and UGG Australia. Simple Shoes, another under the Deckers’ umbrella, launched a Green Bomb U.S. Campus Tour on Earth Day in New York City. The initiative will travel to four college campuses through the end of May, and students can donate used, non-sustainable shoes for an eco-friendly pair by the brand. The donated shoes will go to local charities. 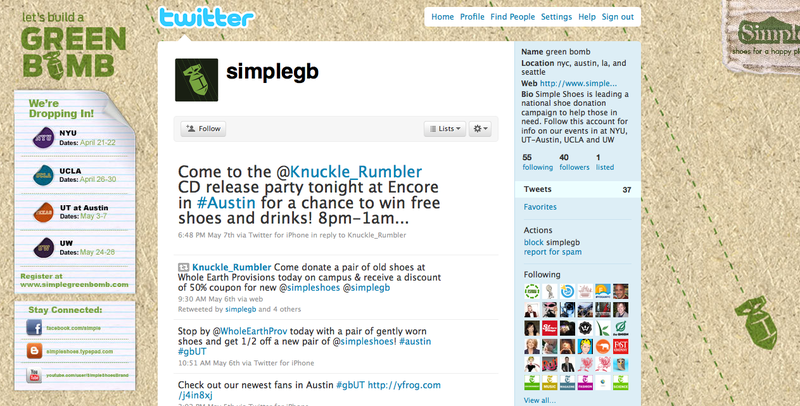 I was intrigued by the plug in this 100-word bio for the Simple Shoes Green Bomb campaign. Little and local, it sounds homey, and perfectly aligned with the brand. The idea is, well, simple: College kids trade in old shoes for a new pair of Simple Shoes, their old pairs are donated to the needy. College kids have no cash, lots of beat up shoes and are green-minded and action-oriented. Plus, you can never have too many clunky shoes in your closet if you’re a college kid. I’d love to know how well the campaign is working and how many shoes have been collected so far. The brand’s Facebook page isn’t all that helpful. Even though the giveaway is happening right now at NYU (through May 28), there isn’t a call to action on the Twitter feed designed for the campaign. Great campaigns work in the follow-through and follow-up. If I were a college kid, I’d want to get involved. It’s the right thing to do, I’d get to replenish my shoe wardrobe and it makes for a very good brand story. So Simple Shoes — I’d love to hear you tell it! What do you think? What’s your story?